A 1969 station concept designed to rotate on its central axis to produce artificial gravity. In this historic photo from the U.S. space agency is pictured a 1969 concept of a space station. The station was to rotate on its central axis to produce artificial gravity. 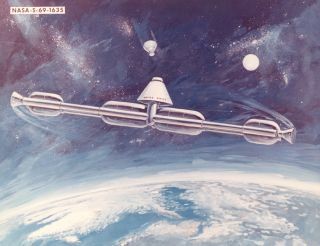 The majority of early space station concepts created artificial gravity one way or another in order to simulate a more natural or familiar environment for the health of the astronauts. After returning from the micro-gravity environment, astronauts find their muscles weak because they have not been using them. Long-term exposure to micro-gravity could generate long-term health problems for astronauts who do not utilize their muscles. This is why there are exercise machines on space shuttles and on the International Space Station. It was to be assembled on-orbit from spent Apollo program stages.